What we identified going into 2018 were 44 Tipping Points with 11 categorized as "High Risk". High Risk has traditionally been approximately 5-7 in size but became the largest we have had going back to the Pre-Dotcom Era when we first started tracking Tipping Points on a site specifically called "Tipping Points". Our tracking methodology was unquestionably telling us that global and US risk was at extreme levels. This didn't mean that something was going to happen immanently, but was suggesting that a small spark could set off a major destabilizing shocks. That subsequently happened the first week of February 2018 and again in Q4 after October 4th. Both were major moving events of "Risk Reversal" -- our #1 Tipping Point. As we begin 2019 our Highest Risk Tipping Points surprisingly remain the same and could best be described as now only a darker shade of RED! Generally, our overall list of 44 Tipping Points remain about the same with some such as De-Dollarization, Growing Social Unrest and Corporate Bankruptcies to likely soon shot much higher in our rankings in our current estimation. The policy shift of the global central bankers is impacting a significant number of our Tipping Points. The global financial markets are so highly over-leveraged from a protracted period of easy credit that to start withdrawing the incredible levels of liquidity is a serious issue to global financial markets which has never been attempted before. Few fully know what to expect! This chart shows what to expect from an era of QE. What it doesn't overlay is an era of QT! Maybe QT is too much, too soon? It has always been the role of central banks to take away the 'punch bowl' just as the party got going! But this has been a "humdinger" of a party, that has been going on for a decade now - specifically since the 2007-2008 Financial Crisis. There is going to be significant, unprepared fallout if the central banks actually follow through with their announced policy guidelines of " normalization". The bond market doesn't believe the central bankers will. It is now starting to shake the Bond Market with volatility not normally seen. We see the potential for major long term reversals occurring in 2019. The "wild card" of course is the central banks adopting further untested Monetary Policies and the possibility of a further "Minsky Melt-Up" being triggered by this a the possibility of "QE for the People". We expect the EU to take center stage in 2019 as the great experiment proves to be flawed and the adjustments required are not acceptable to ever increasing social unrest and rising "populist" governments. ... a reversal later in 2019 in the US Dollar. There is a real possibility that the Credit Cycle may be extended further thanks to coordinated central bank policies. This is something we are carefully monitoring. Inequality & Social Unrest is clearly evident with “Populist” Governments and a shift to the left increasingly more evident. Inequality at #12 has risen because of the disparity between who has been winning and who have been suffering through the asset bubble created by the central banks sustained easy money policies. The top 5% of the population that owns assets have won big. The bottom 95% have not ,while experiencing the inflationary effects in the form of higher healthcare, education, housing & rental costs and salaries not keeping up with the cost of living. This is now leading to potential growing social strife. We have a continuously slowing growth rate of the Global Savings Pool. This problem will increasingly become a serious impediment for the financial markets in regards to securing of sufficient investment capital and maybe even more importantly - new unencumbered and non re-hypothecated collateral. This problem is central to the "Big Reversal" Theme we will talk about a little later. The "gutting" of the working Middle Class has been a theme of ours for a few years now but we now see it to be a potentially de-stabilizing Tipping Point. The degree to which the US has become a sub-prime economy, the levels of household indebtedness associated with payday loans, home equity loans, student loans, credit card balances have left US consumers strapped for discretionary income. In a 70% economy like the USA, this is a serious problem that could be even more aggravated with a cyclical overdue recession and advancing forms of job replacing robotic automation. The US consumer has long been the mainstay of the US economy and for that matter post WWII global economy. A weakening US consumer is something the world has never experienced and is ill prepared for it! We have talked extensively about Zombie Corporations and the level a Corporate Debt Growth. During the next recession it will become a major issue and in fact may be what triggers a Global Recession! Not to go through all 44 tipping points, but I do think it is important to mention that items like Cyber Attacks and the resulting unknown complexity failures should not to be ignored. Often major crisis arise from something in common view but is taken for granted until it suddenly "tips" the scales and rapidly de-stabilizes markets and economies. One of the many reasons that the Tipping Points are important to our work is that it forms the basis for launching our "Abstraction" methodology which is the foundation for our many investment Thesis' during the year. We share these with you as part of our Strategic Investment Insights (SII) thinking and Watch Lists. They are not recommendations but rather simply outputs from our research for your consideration. We take the Tipping Points shown here on the left and try and identify patterns and relationship groupings. These we then over the course of the year attempt to Synthesis into ideas or concepts that may not be self evident. Our MATASII Themes section, videos such as UnderTheLens & LONGWave, articles & papers, Macro Maps etc. are tools which are all part of the work we do during this process which we share with you through our ongoing postings. The culmination is our Annual Thesis papers listed on the right. Last year it was "The New World Order". This year our Abstraction methodology has highlighted "De-Dollarization. This is a natural by-product from the expected shift from a Uni-Polar World to a Multi-Polar world was laid out in out 2018 Thesis paper - The New World Order. We are going to talk more about it in a moment, but before we do I would like to take some time to talk about some of the shifts in our Themes section which is part of our abstraction methodology. These are some of the key new Themes which our process has isolated as we begin 2019. You will notice immediately that they are heavy in the Political and Global sphere - just as we expected they would be. We didn't pull them out of the air or from the nightly news. They came from our 2018 year end Tipping Points and Themes that were growing throughout 2018. Last year we identified these important relationships which we shared with you. We refer you to last years UnderTheLens video which can be found and referenced on the MATASII web site. As well as Political groupings and abstraction. This Year we have highlighted further developments. Our red Tipping Points are clearly pointing in the area of Economics to the end of the current credit cycle and economic expansion phase. A major reversal lies ahead. Developments in the area of De-Dollarization is supporting last years grouping of a "Major Financial Dislocation". This is turn supports the abstraction of a "Big Reversal" and "De-Stabilization of the Status Quo". In the area of Political groupings the degree of social unrest - whether the "yellow vests" in France, or US political polarization regarding immigration are supporting our abstractions of mounting policy extremes and political upheaval. In blue the 2018 thinking regarding trade conflicts and protectionism has only further intensified, accelerating de-dollarization due to the weaponization of the US dollar for the US to maintain control of its Uni-Polar world view. One of the many road maps we have laid out to assist us with identifying Themes to watch for is shown here. We have shared this with you in previous videos. This is a sequential road map with key blocks or trends we should be expecting. There is no time frame with it as it depends on the sequenced events. We could spend a lot of time on this graphic, but we don't have time for that today. To position what we should expect, it needs to be built on a clear framework of where we have come from. GROWTH IN DEBT: First when you start to consume more than you produce or simply choose to live beyond your means, you obviously start to build up debt. You have a lack of savings and soon having slowing rates of productivity improvement in the overall economy because of a lack of investment into productive assets. SOUND MONEY REMOVAL: It isn't long before the economic system is forced to move to a "Fiat Currency" system to keep the economic system afloat. Improvements in Standards of Living slow, CAPEX expenditures slow and the Velocity of Money falls. FINANCIAL REPRESSION: The economy is forced towards "financialization" as Macro-Prudential Monetary Policies such as Financial Repression are adopted by the powers to be. These policies force unproductive risk taking, poor lending practices, mal-investment and excess levels of leverage into the economy. POLICY PROBLEMS: Soon Public, Fiscal & Monetary policy issues become center stage to expediently handle the unintended consequences. "Kick-the-Can-Down-The-Road" seems to become the solution of the day to avert continues crisis. If any of this sounds familiar it is because that is where we are today. As the requirements for the growth of Financial Investment grows to support debt & leverage levels, the slower growth rate of savings becomes a bigger and bigger problem. Government policy programs consume larger amounts of the productive assets and savings of the economy. Soon a shortage of new collateral to secure new borrowing becomes a real problem. Instability makes existing collateral values more volatile. This leads to even a greater shortage of lending collateral. A FIAT CURRENCY FAILURE: What soon happens is the currency of the economy becomes exposed as foreign lenders call into question the collateral value underpinning the economy. As the currency begins falling, hyperinflation begins. Hyperinflation is first and foremost a currency event. It rapidly accelerates with governments having few options left. SOCIAL STRIFE: Like Venezuela today, social strife soon consumes daily life as one failed attempt after another is foolishly tried until the economy resets in a devastating fashion and policies of Sound Money are forced to be restored in some fashion. NEW ORDER: The crisis fosters new systems, policies and even institutions. You can see from the red mark in the center star where we feel we are today and what therefore likely lies ahead. The "Big Reversal" is centered on shifting global demographics, Capital Investment and Savings levels, pending entitlement payouts and borrowing demand or supply. Investment will continue to grow but the rate will slow slightly driven primarily by the maturation of the capital intensiveness of Industrialization. Simply said, it takes less capital to start a factory than start a software company. The growth rate of Savings on the other hand will also slow but at a faster relative rate. This is driven by an aging population and a slowing birth rate. Entitlement program promises are coming due, in a massive way and will need to be funded. There are $84T in unfunded and underfunded US government Entitlement requirements alone. Supply generation of debt is going to balloon at the same time the funding availability for demand will be crimped. The result can be expected to be rising funding rates and a shortage of unencumbered collateral to support new lending and debt creation. This is a road map you have no doubt seen before. We have had it since the Financial Crisis when we first put it together. The 2007-2008 Financial Crisis effectively took place in the upper left corner. To possibly be over simplistic, it was primarily US Housing Centric and Financial in nature. Yes, it had spillage around the world but it was primarily a Federal Reserve and US government problem. Since the underlying problems we felt were not fixed at that time, we felt that the central problems would only grow and issues would become Economic in nature and much broader and regional in scope. By 2012 in fact we had massive banking problems across the EU, Greece and even down to Cyprus and the East Bloc nations - impacted by poorly capitalized and unsound European Banks. It has been our view and continues to be that this is leading to even greater numbers of problems which will be both political and global in nature. If we are correct then our Tipping Points and emerging 2018 & 2019 Themes should be signalling this. And they have. We still expect a Global Crisis within the next few years in the risk free, IG and HY bond markets centered around the $550T OTC Global SWAPS market for Currency and Interest Rate hedging. it is almost a foregone conclusion - only the timing is in question. I would like to shift now to some discussion on our 2019 Thesis paper - De-Dollarization. Our paper is over 154 pages and is extensive in laying out what is presently occurring globally regarding De-Dollarization. What actions Countries are taking, important new developments, alternatives to the US dollar as well as what the Global Outlook is as a consequence. What we see is a simplifying illustration is we have a Tidal Wave or Tsunami approaching which is a Fiscal Wave of unresolved problems ranging from unfunded entitlement programs, economic inequality, a generational pension crisis, growing budget deficits, falling productivity, slowing money velocity and supply. This in turn is facing pressures from Debt Saturation at all levels. Global Debt, Sovereign Debt, Corporate Debt and Household Debt. The problem is that our entire global financial system is based on the determination of the pricing of Risk via the US 10Y Treasury Note. It is considered the "Risk Free" baseline. This is becoming increasing flawed through monetary policies such as QE. What is worse is that the entire edifice is built on the US dollar. 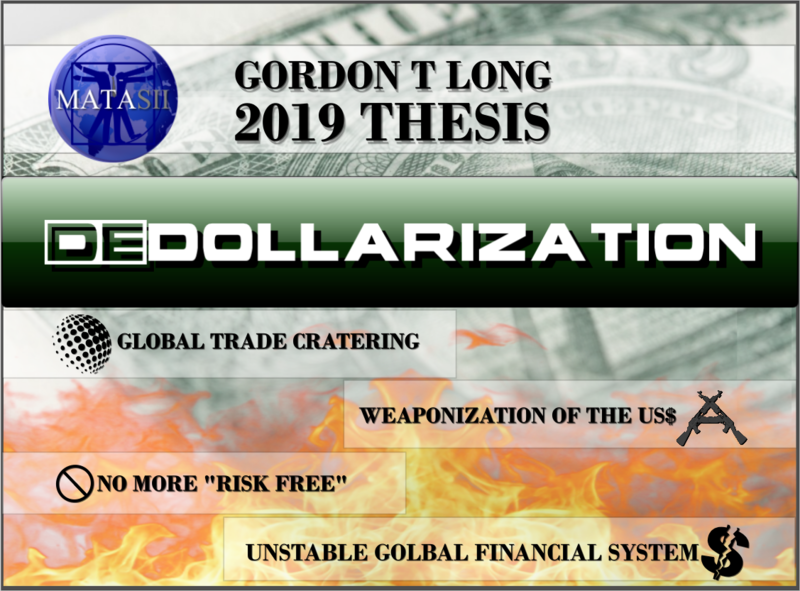 Our 2019 Thesis: De-Dollarization lays to rest the precarious exposure this now represents to the global economy. US now faces its first Recession in over a decade with highly leveraged corporate debt levels. This illustration is what investors & traders should take away from De-Dollarization. Basically we will see the asset prices deflate for those things we want and normally finance, while prices will rise for those things we need but normally don't finance. Remember, when Asset Prices fall while rates rise it means it means you get less for more. Capitalism gets you more for less. The consequences of socialist programs eventually result in you getting less for more. 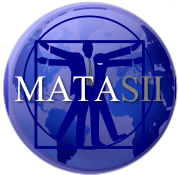 The Thesis is available now in the subscriber section of the MATASII webs site. So, in closing, as I always remind you – remember the answer will be to print more money. It is the only answer politicians will ever agree on. Until No one wants it or Trusts It! As negative as these comments often are, there has seldom been a better time for investing. However, it requires careful analysis and not following what have traditionally been the true and tried approaches. Do your reading and make sure you have a knowledgably and well informed financial advisor. So until we talk again, may 2018 turn out to be an outstanding investment year for you and your family.